TIVO is a wonderful device because it uses data mining techniques like association rules (the same ones used by retail websites such as Amazon.com) to intelligently suggest shows you might be interested in based on what you’ve watched in the past. 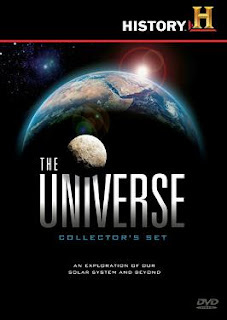 A while back it started recording The Universe show on the History Channel and I’m sure glad it did. It turns out this show is a great educational resource and I enjoy pretty every episode. Now I have a TIVO “Season Pass” to make sure I grab each Universe show. The range of topics is superb for an astrophysics enthusiast like me. Some of the recent topics I’ve watched are: origins of the big bang, the Milky Way, Mars, gravity, parallel universes, exoplanets, the outer planets, and many more. I usually watch each show twice, one time all the way through just listening, and a second time taking notes. The show hosts a wonderful website at History.com where you can watch full episodes, and participate in a discussion forum. You can also download episodes on iTunes and watch them on your iPod which is a great way to pass time while waiting around at the carwash.